Each of our affordable Broadbeach apartments has a master bedroom with an ensuite bathroom and separate shower and toilet facilities. Every apartment has a fully equipped kitchen, washing machine, dryer, digital dial in phone, TV and Foxtel. Fresh linen is supplied weekly. The 2 bedroom apartment has one Queen sized bed and two single beds and a maximum capacity of five guests. This apartment features a balcony with picturesque views. It offers a fully equipped kitchen. Please note this apartment is located at 8 Queensland Avenue Broadbeach, which is located next door to Barbados Holiday Apartments. Gusts must check in at Barbados Holiday Apartments, located at the address stated in the booking confirmation. The contemporary air conditioned apartment has a generous master bedroom, spacious state of the art kitchen, fabulous bathroom and trendy lounge/ding (TV Foxtel + WiFi). The open design of the lounge/dining leads onto north-facing balcony overlooking the pool. Office style work space is also included, ideal when you need to keep in contact. This two bedroom Dream Suite Apartment has a queen size bed and two single beds with a maximum capacity of five guests. Fresh linen is supplied weekly. Please note this apartment is located at 8 Queensland Avenue Broadbeach, which is located next door to Barbados Holiday Apartments. Gusts must check in at Barbados Holiday Apartments, located at the address stated in the booking confirmation. 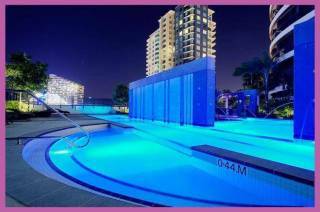 Just minutes to beach, virtually onsite are cafes/restaurants, easy stroll to shopping centres, Convention Centre, … and of course Jupiters Casino. There are many attractions near to Broadbeach, local bus/tram to Sea World, Carrara Markets, and within 18km Movie World, Dreamworld, Wet-n-Wild, etc, also Gold Coast Airport. . We have onsite Ticketing for Theme Parks and Events etc, some offering good discounts. Access is with no stairs, secure parking under, lift to all floors. Just two apartments per floor. All apartments include Queen master/ensuite, BIRobe, second bedroom with 2 single beds, BIRobe, modern bathroom/separate toilet, full kitchen and internal laundry facilities, fully furnished and beds made-up with fresh linen, towels, etc. Air conditioned livingroom. Designed for up to 4 guests, Extra guests may stay with sofa/roll-away beds/linen, etc supplied for a fee. All apartments have front wider balconies with table setting, sunny North facing over pool/parklands and easterly some with sea views, Resort cabanna/BBQ, jetpool/waterfall/pool, sauna/toilet/shower. Laundry facilities and a full kitchen with a dishwasher and microwave are standard in all apartments. Each air-conditioned apartment features a spacious seating area with flat-screen cable TV. Guests can relax in the sauna, or enjoy the sun on the poolside deck. The tour desk can book tickets to the Gold Coast theme parks, including Dreamworld and Movieworld. We also have extras for Hire such as boogie boards, beach umbrella, battery powered ride-on, port-a-cot, highchair, stroller, beach cricket set, fishing gear/net, kite, totem-tennis, DVD player, DVDs … more all at our small kiosk. Also complimentary wheelchair or wheelie-walker. Internet: WiFi is available in the hotel rooms and charges are applicable. Parking: Free! Free private parking is possible on site (reservation is not possible). If cancelled within 30 days of the date of arrival, 100% of the tariff will be charged. 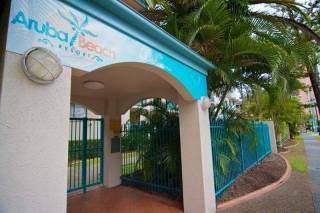 Our affordable Broadbeach apartments are located at 12 Queensland Avenue in Broadbeach, close to a huge selection of fabulous restaurants, shops, family attractions and world renowned beautiful sandy beaches. 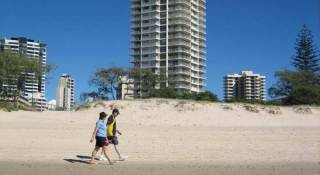 There is free secure undercover parking at our Broadbeach family accommodation. 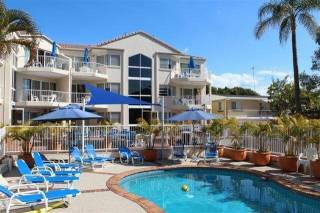 Barbados holiday apartments are easily accessible from the Gold Coast highway. We are located 300 metres east of the Convention Centre towards the beach. 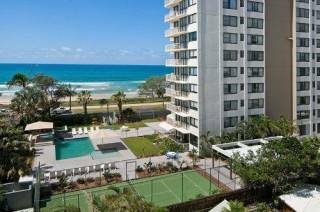 Our apartments are just 30 minutes drive from the Gold Coast Airport and one hour from Brisbane airport.